Here we are again with yet another blind review. 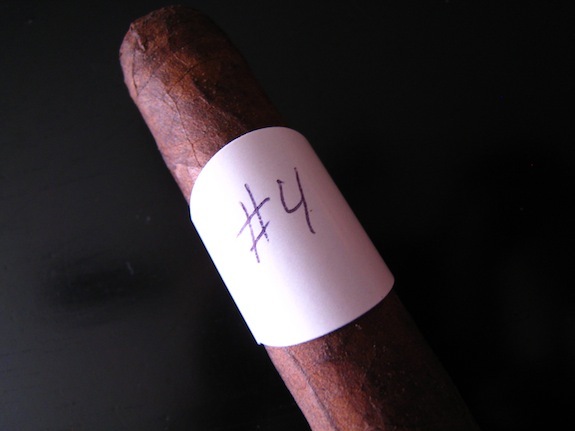 The fourth cigar in a set of five sent over from Brooks at Smoking Stogie. I sound like a broken record but I strongly urge any of you readers who have not had the chance to check out Brooks’ site, to do so. He’s got some of the most honest reviews and best photography of some of the most ridiculously expensive, and hard to find cigars ever produced. Without further adieu, let’s get to the review. 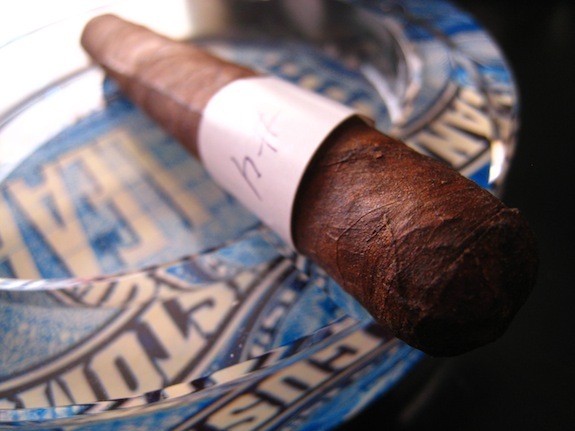 Prelight: Blind cigar #4 carries a very old, rustic looking maduro looking wrapper. The color is an off chocolate brown with shades of almost black, and even bright orange. 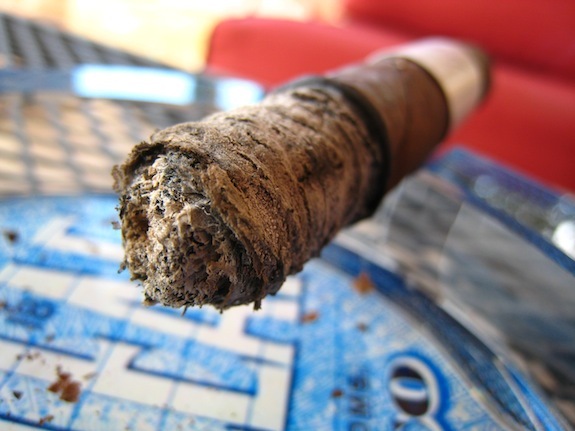 The wrapper looks like it has seen better days, but some of the tastiest cigars look, and smell awful. The oily wrapper leads up to a very crooked, round, triple wrapped cap. The construction is a bit odd. The body is composed of tons of larger veins that I hope don’t offset the experience. The cap and nub leading up to it are slightly crooked. Almost as if someone grabbed the top of it and yanked on it. This definitely looks like something that’s been around a while. The body is firm for the most part, but gets very soft the closer you get to the foot. The wrapper gives off a very sweet and almost floral aroma. The foot only releases a very light floral scent that is quickly overpowered with a ton of spice. Cigar #4 clipped very cleanly, although it was a little resilient to my double bladed Palio cutter. The cold draw produce this extremely pleasant, and smooth natural tobacco taste with just the slightest hint of spice on the aftertaste. First Smoke: Right off the bat I am getting a really deep, meaty, woodsy taste off this cigar with hints of earthy undertones, espresso, and maybe even a bit of clove mixed in there. The draw is effortless, and average sized pumping out a thick cloud of white smoke. The burnline is pretty thick for the most part, but burning perfectly. There is very little stationary smoke coming off this cigar, but it smells like straight up cedar. I’m getting a slight saltiness from the wrapper, but nothing compared to the Cohiba Brooks surprised me with last review. 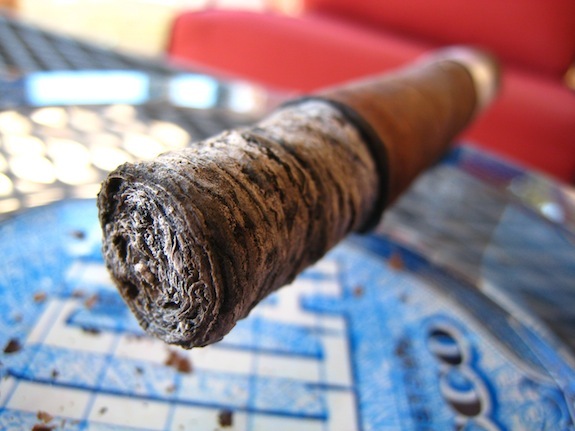 The ash is well compacted, and light grey with very small darker grey stripes which only head onto the foot of the cigar for about an inch before falling into my ashtray. Halfway there: The more I smoke this cigar the more familiar it becomes. It really tastes like a blend I may have had before, but I can’t for the life of me figure out what on earth this cigar is. I’m getting a slight mix of pepper and spice creeping into the flavor profile now. The dominant flavors are still heavy cedar/woodsy and espresso with a touch of bittersweet chocolate. So far the larger veins haven’t hindered the experience in the least, but into the second third I am starting to get a lot of draw resistance. I am hoping this is only a phase. The burnline and ash is still just absolutely perfect. Not only am I loving the flavor-packed consistency of this cigar, but the retrohale is to die for as well priming with a very sweet, dark chocolate and cedar. I am feeling very little nicotine, any lightheadedness was a product of the tight draw. Finish: I am getting a ton of spice (not to be confused with pepper) from this cigar now that the draw has completely opened up. 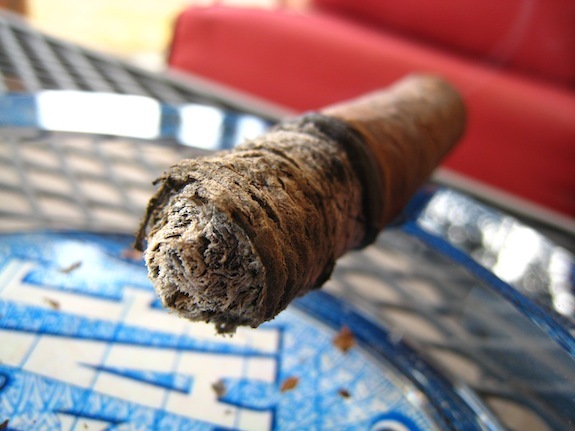 Mixed in with a splash of nutmeg, cocoa, and espresso, this cigar is finishing off much like an excellent cup of coffee. The entire experience has been smooth, and creamy, and the final third just brought that to a new level. The burnline and ash have been just perfect the whole way though. This little corona had a very slow burn, resulting in almost an hour and a half total smoke time. There was a slight bit of harshness into the very final inch of this cigar, but I think a lot of that had to do with me fighting the tighter draw early into the smoke. No nicotine at all. Overview: This was yet another stellar cigar Brooks sent over. This has classic maduro written all over it. Very complex, very smooth, and extremely enjoyable. This is a stick I could see myself smoking anytime, any day. 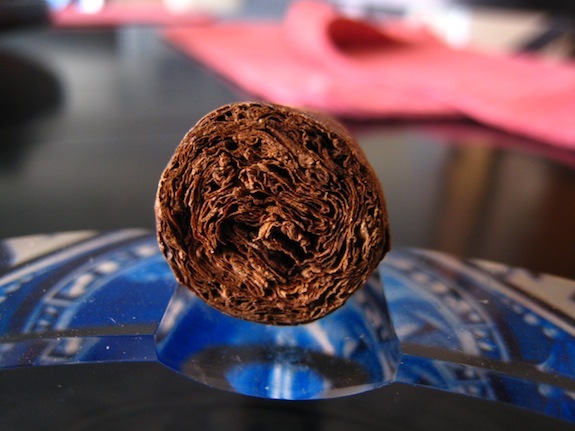 It would be an ideal cigar for those early mornings, but complex enough to hold your attention even as an evening smoke. Final Guess: I have no idea what this cigar is, but yet, it seems so familiar. If I had to throw something out there I would say it was either a Tatuaje Cabaiguan Guapos Maduro, or a Cuban Cohiba Maduro. Chances are, I am way off. So what was it? A 2007 Henry Clay. What a shocker! 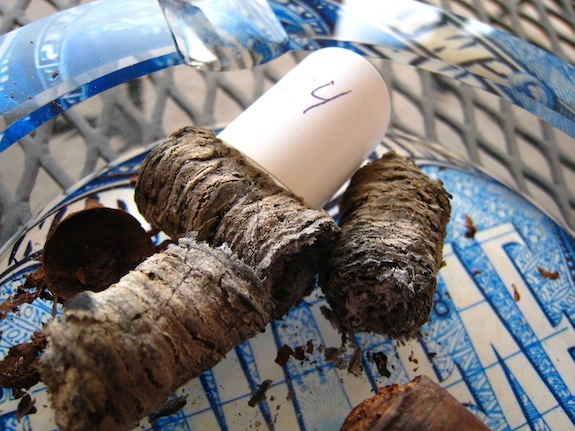 This is a cigar you can pick up just about anywhere for about $3 to $4. I’ve even seen them in random hole in the way liquor stores around town. Either way, it’s a great cigar to have around, especially at that price. We all know I am a sucker for Connecticut Broadleaf, and that’s probably the main factor causing me to enjoy this cigar so much. If there was just a bit more pepper I would have been dead set on it being a Tatuaje. In talking with Brooks he brought to my attention that this cigar is actually one that Pete smoke quite a bit of, and has been for years. The inspiration shows through in my opinion. Where can I gat these? I did a search but only found a couple reviews. Once again. great detailed blind reviews. Thanks for the kind words Blane! We have one more coming later on this evening! 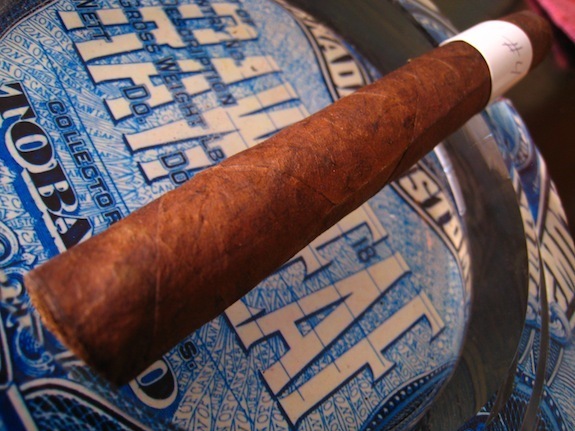 What do ya know, an inexpensive cigar that one of the most popular boutique cigar makers loves to light up. Priceless!! Looks like another perfect example of how a budget cigar can surprise you when it’s smoked blind. I got the same affect on my AF Curly head. Very nice, sounds like a damn tasty smoke!